This was my first Facebook game, my introduction to scrum, and my first encounter with live ops analytics. The Kudos team was a small and passionate group. This was the perfect environment to learn about and adapt to an agile working environment. In this role I worked parallel to our Product Owner while under the direction of the CEO and COO. My job was to take ideas, concepts, and inspirations, provide feedback, then translate into those ideas into working design specifications for implementation. 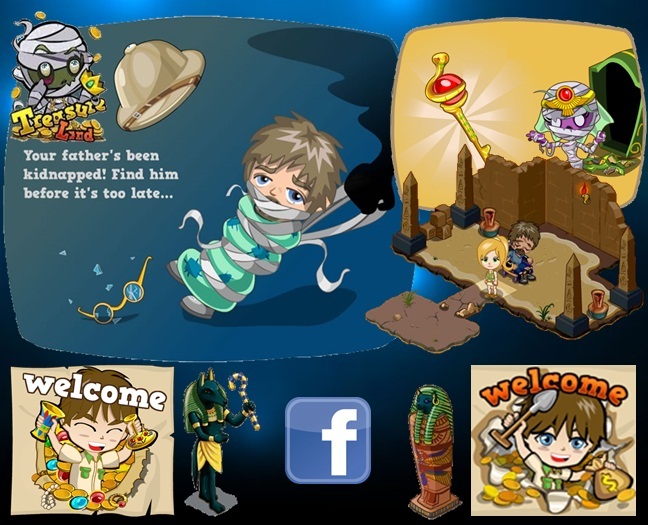 Treasure Land was a Facebook game about, you guessed it, collecting treasure! Very much a classic treasure hunting game, our innovation was to add an epic story about rescuing your father, defeating an ancient evil, and fighting snakes and ninjas. Our quest system was expanded to provide a simple form of dialogue dependent on quest states, usually controlled by objects or areas searched. Led a small dedicated team in feature implementation. Personally coded a randomized treasure chest system. Assisted in Art Direction, working with the COO. Final approval on level design and mission content.